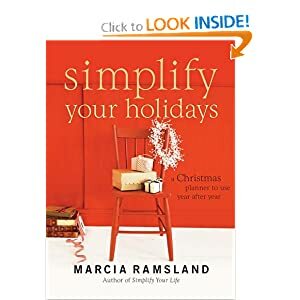 As promised somewhere in these 31 days (I simply cannot find it now…), here’s my list of ways to take back moments each day that will result in our enjoying the (Holiday) season a little more fully without adding to our costs or stress or endless ‘to do lists”. 1. Go to your spice rack, pick up the cinnamon and cloves, close your eyes, sniff and for 15 seconds. Whisper your gratitude for the season to come. 2. Today go out your front door or onto balcony, take your sweater but don’t put it on, let the cold, crisp air really hit you. Then go back inside to the warmth and put your sweater on. Whisper your gratitude that you have heat in your home today. 3. When you buy your groceries today, buy an extra can or two for the food drive at your church, school, etc. Whisper your gratitude that you can. 4. When you arrive home at night, and the house is lit up. Sit for 20 seconds and just enjoy it, don’t focus on what you’d do differently with more money or time, just enjoy it. Whisper your thanks. 5. At the end of the day, turn off all the lights but those on the tree. Sit in the light of the tree for a bit and give thanks. 6. After you’ve made your favourite soup or stew, etc – sit down with your bowl but wait a second before you start eating. Remember why it’s a favourite and savor the first bite. Whisper your thanks. 7. When you receive a card in the mail, don’t open it right away, wait until you have 30 seonds or more, preferably with a cup of tea, sit down, think about the sender, their friendship and what it means to you – then open it and enjoy. Whisper your thanks. 8. Take a minute today to think about those who will not be with you this season. Let your heart be softened by the sadness, and then whisper your gratitude. 9. Find the nearest child, sit with them, listen to them and enjoy the splendour through their eyes today. Whisper your thanks. 10. In a dark room, light a candle (scented if you like); reflect on how the darkness is displaced when a light is shining, no matter how small. Whisper your thanks. 11. When a fresh snow is falling, go outside and try to catch a snowflake on your tongue, take someone along and you’ll laugh too. Whisper your thanks. 12. When you are shopping in a mall where Christmas music is playing, take a second to just sit down on a bench and listen to the song and watch the shoppers going by. Whisper your thanks. 13. If you come across a fire burning in the hearth of your home, or someone else’s, take a moment to sit by the fire. Let the warmth touch your face. Whisper your thanks. 14. Eat a candy cane, really slow (make sure it’s fresh). Whisper your thanks. 15. When you wake up in the morning, don’t rush out from under the covers right away, linger a moment in that early morning peace and whisper your thanks. 16. When something pretty and sparkly catches your eye, stop long enough to really enjoy it. Whisper your thanks. 17. When walking to your car, enjoy the crunch of fallen leaves or snow. Whisper your thanks. 18. When you come across a frosted window, scratch a greeting into it J Smile to yourself. 19. Read Matthew 11:28-30 and reflect. Then read Luke 2: 10-14 and reflect. 20. Call someone at an hour when you know they won’t be home and leave a brief message of love on their voice mail. Wish them A Happy Holiday season. 21. Take a walk to the mailbox, or the end of your driveway or to the foyer of your apartment building and as you go, hold hands with one of your children. Whisper your thanks. 22. Pull out a favourite classic and take a few minutes to just reflect on why you love it so much. Set aside some time later to read a chapter or two. 23. Put a Christmas ornament in your car, hang it from the dashboard and be merry. The sillier the better. 24. When you hear your favourite Christmas carol or song come on at home, sing along, at the top of your lungs whether you can sing or not. Enjoy the release of joy. 25. Whenever you can, pay it forward. Leave some parking time on your meter for the next guy, pay for the coffee of the guy in line behind you in the drive-thru, tip the server – spread the holiday cheer and it will follow you wherever you go. Just a side note, there are things that you could do to fully immerse yourself in enjoyment of the season that take longer (go for a long walk in the snow, take in a musical or ballet or variety show, go to mass or a church service, watch a favourite old movie, etc) The obvious reason they didn’t make this list, is that I was giving you tips for quick 30 second “moment’s” to refocus or recenter ourselves and truly enjoy our days more fully this year. of the harvest for yet another season of growth. As we near the end of our 31 Day journey, I decided that today’s post will simply be a personal reflection on endings. We seem to struggle with reconciling ourselves with TIME. We never have enough of it, seldom make the most of it and often waste it. I know for myself, I make every effort to avoid grief, sadness and discomfort, thinking that in embracing it, it’s not a good use of my time. But why? I think I do myself a disservice? I believe that God created the world we live in to demonstrate how the grand scheme of things works – over and over and over again. Every ending is followed by another beginning. Why is it that we get so hung up on the sadness of endings that we miss that? Why do we not use the seasons of endings to celebrate life as well? Isn’t that how God designed it? Why do we resist them? avoid them? see them only through eyes of sadness? Have we not fully enjoyed each season? Why not? Will resisting letting go and saying goodbye help to change that at all? Of course we know this is not the case. I post this mostly because this past year I’ve gone through a serious shift in my life. I left the job and church that has been the central hub for most of my adult life (over 16 years). I felt it coming for so long, yet I resisted. I fought it internally and it carried over into my thoughts, my prayers, my conversations. There was no ONE thing that brought about this change, except perhaps, God’s direction…but I needed something to blame, a reason, a justification. Now I’m asking myself why? There’s is no reason that our gardens die off, that the summer turns into autumn, into winter into spring…they just do. Sometimes there is no specific reason for a friendship to peter out, or to change jobs, churches, affilitions… they just happen. Rather than fight it, why not celebrate it? Reflect in grace on all the good, in faith let go of the not so good. Embrace the beauty of the current season with joy and look with hope and expectation of the glorious season to come. Every season has beauty after all – despite the downsides and they have those too. We can choose to celebrate or to mourn. Both are blessed seasons of life…meant to bring us to the fullness of God. Here in Canada, the glory of fall will be brought low within a week or two. Then it will be cold and grey more often than not as winter moves in… I will choose to celebrate the end of a lovely season by fully embracing the holiday season in my heart and home. I will walk in gratitude by choice and I will approach the changes in the other areas of my life with the same grace, faith and hope. It is a beautiful season in my life, God is good. I must preface today’s post with a shout out to my “peeps”. The ones to showed up today on a rainy Saturday afternoon prepared to party inside or out with us – regardless of the rain. 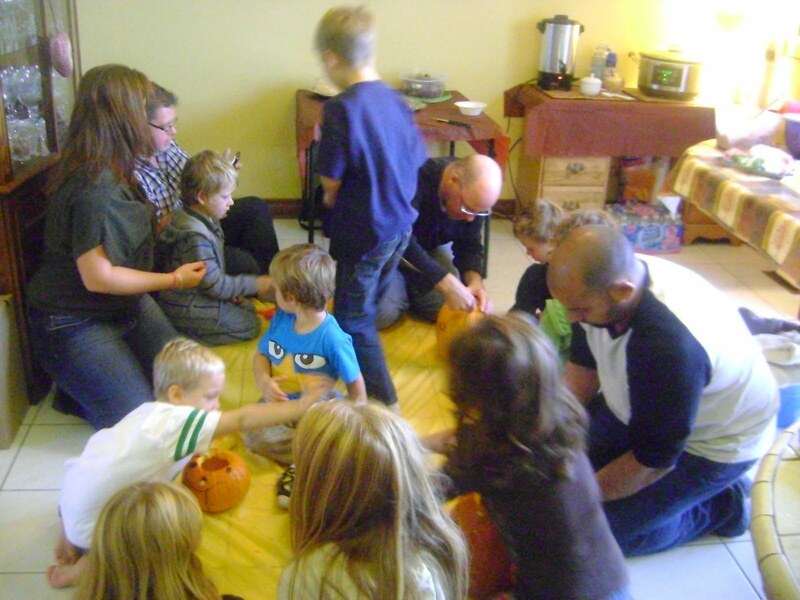 We had a great time hosting our Annual Harvest Hoorah. Due to the rain, all the games were cut. 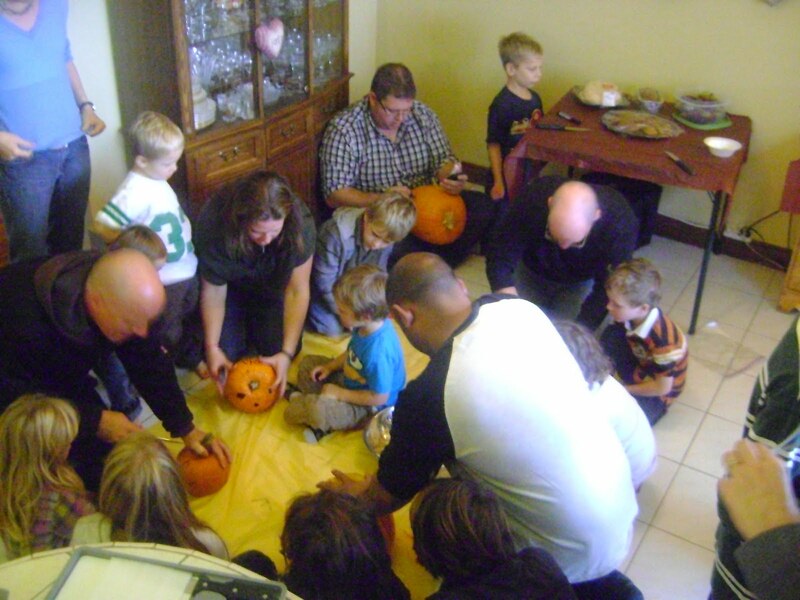 But we did manage to carve pumpkins on our kitchen floor – mostly the dads and all the kids fit in there. 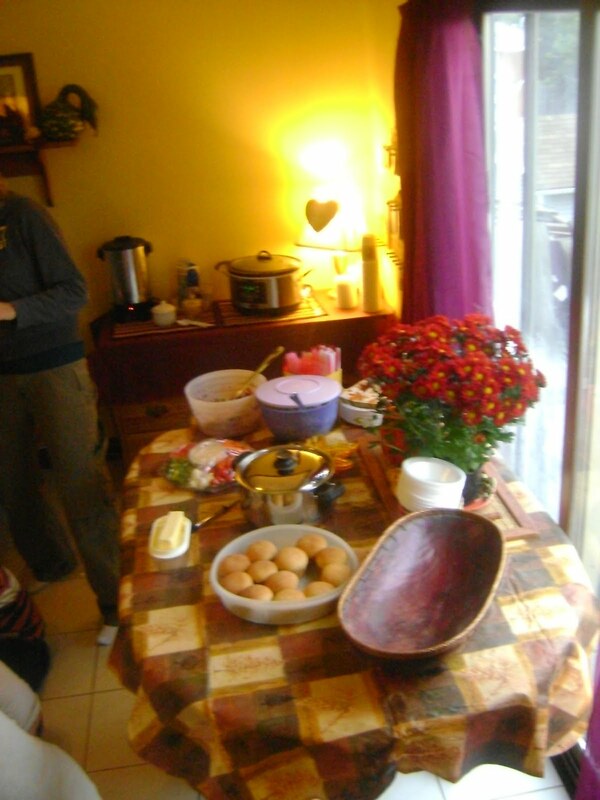 The potluck was super yummy and the visiting was much needed and I think enjoyed by all. 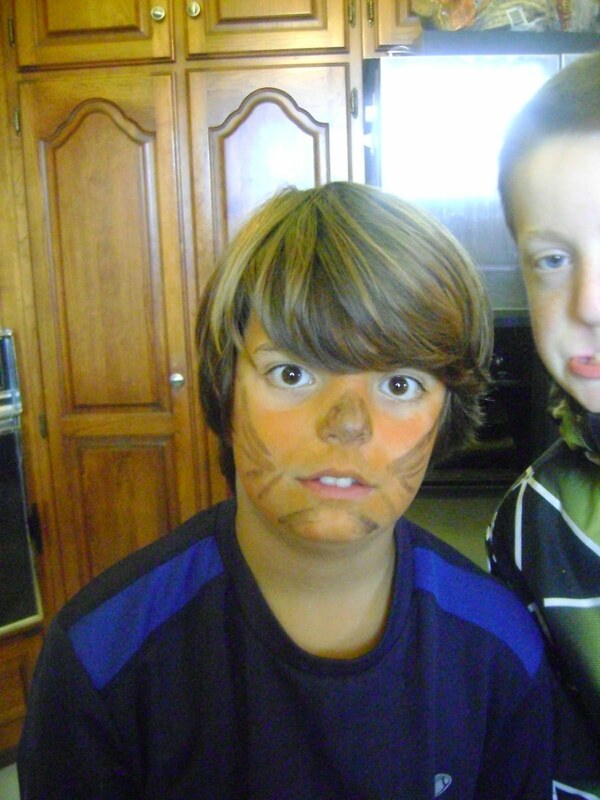 Special thanks to Julie for doing the face painting for the kiddos! I just stood back a couple times and watched as everyone was reconnecting, new aquaintances were made and the new babies were cuddled. We laughed at the bigger kids running through the house and into the yard and having a riot, sneaking all kinds of treats and polishing off the hot apple cider. The rain did manage to clear up for some to enjoy a fire out back. After everyone had left I had such a nice visit with my younger two boys on a blanket by the fire. They were full of tales of their day and questions about the fire and the stars and the red leaves on the maple tree behind us… sigh. It was perfect. Now as I write this post: the dishes are done, the furniture is put back, the garbage out, the dog fed, the boys in bed… some of the men folk are having a poker game in the “man cave” of our garage. I’ll be going to sleep a contented woman tonight 🙂 I’m so grateful for the community that God has given us. My mom started this tradition when I was young and now when we celebrate Christmas with my side of the family, we continue with it. It’s always a bit different, but always special. After dinner and the fun and games just before the kids go to bed really, we pass around a candle and share our gratitude for something/one from the past year and/or our hopes & prayers for the coming one. Hubby and I prepare our boys stockings and leave them on the foot of their beds on Christmas Eve after they’ve fallen asleep. I love hearing them whisper and squeal in the morning, (and it also gives us a couple minutes more to wake up, while they check out their treasures). Also, hubby and I exchange stockings too so we can join in on the fun. I love watching the boys interact with their grandparents and this is always a fun and messy event. My mom makes these for us at our family gathering and they are simply delicious – round puffs of warm pastry smothered in cinnamon and honey-lemon syrup. 5. 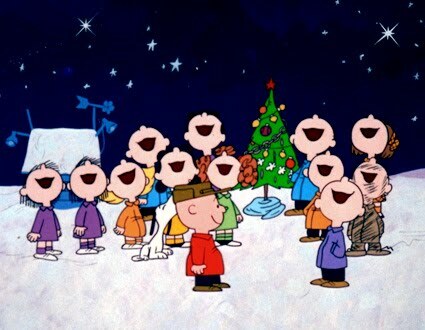 Christmas Carols – either via carolling or participating in church services. I love to sing them, I love to hear them. 6. Watching Christmas movies by the tree all lit up. The most important thing to us is to be together, loving each other and the One who the season is all about. We honestly have so many more things that we do each year. I’m looking forward to December because we can do so many more little things to celebrate all day long as homeschoolers. Ho ho ho! One of our favourite family activities over the holidays in snuggling up together under blankets and quilts, by the lit tree, to watch some favourites. We’ve seen them all, and will watch them again and again. I like the classics and a good romantic comedy thrown in for good measure. The kids like cartoons, and the new digital media like in Polar Express. Before we had kids we could drive to the city more often. Go skating in Nathan Phillips Square, go window shopping and check out the decor at The Eaton Center. One year I went to hear Handel’s Messiah and another to hear the Pops Symphony Orchestra. A few years in a row we got tickets to see the Nutcracker Ballet. Over the years we’ve also been involved in community or church productions. Many of our favourite memories over the years were on or offstage with these productions. I still dream of spending a December week or so in New York City. And I’d also LOVE to see the Christmas Show with the Rockettes at Radio City Music Hall. I could’ve written so much more today, but it’s a busy day and I gotta run! Are you enjoying the season fully? Hope so! Fully Enjoying the Season – Day 27 – Extra Extra Read all About It! 27 Extra Extra Read all About It! Todays post is dedicated to newsletters and Christmas Cards. It’s a past time that unfortunately is not as popular as it once was. If I know you personally, please don’t send me digital Christmas cards, not my favorite and I just think it requires so little effort to send a card. Especically if I send you one… Newsletters are passable because you took the time to write them, and I can print them out. Otherwise, if I only know you via digital media than send those digital cards at your pleasure. Our first Christmas we used our budget to buy a good tree, decorations were sparse. So I used the Christmas cards that arrived in the branches as decorations. Still one of my favourite décor memories… my personal favourites are sparkly cards, or photo cards which go on the inside doors of my cupboards all year. I also love handmade cards – though I do not make them myself. I love it when people take the time to write a personal message in each card – that is dedication and sincerity at it’s finest. I love going to the mail box and finding treasures. I wish we could force society to revive the art of letter and card writing…it’s so perfectly perfect. It was an easy way to share the little bits people wanted to know to keep “in touch” and equally an opportunity to let people know that I care and encourage them by sharing from my heart even just a little, each year. So I continue to do it. Every year, I contemplate discontinuing the Heaslip Herald…(not because it’s troublesome, but because I guess I think I’m not working in that field with those people any more, and perhaps I am thinking I”m more important to people than I am in reality?? But then again, why bother blogging if that’s the case? In light of eternity, I matter to God, so all that I have I am willing to share because…we ALL matter to God. Which essentially is the green light to do another one. It’s not hard because I save the template and fill in new information or bit and pieces that come to mind. Some years they are funny, some years they are sentimental, but every year it’s heartfelt…and I think that’s why people like them. I also like the benefit of having it for the memory box/book to remind me of the little things I may forget if not for the creative effort to share the news with faraway friends and family (the funny thing is a lot of my nearby friends want them too…well maybe it’s not funny, just nice. Anyways, here are my tips from years of doing this. 1. Keep it simple. You don’t need to even write it as a “letter”; though these are nice too. But if the thought of trying to find the right tone and what to include, etc is overwhelming… there are templates you can find for free that do it up like little “articles” – I like this way because I can separate my three boys, have one updated pic of each and it can even be point form. but is a perfect example to illustrate my point. 2. Have an opening note expressing gratitude and perhaps shed light on the kind of year you’ve had as a family, be honest but let your hope shine (downer letters aren’t really fun to write or read). I also think it’s nice to reflect on your focus or hope for the upcoming year. 3. Have a “highlights” or year in review section, but keep it brief. Feel free to include new adventures, challenges, etc. that anyone in your family encountered. 4. Don’t overdo it with pictures – pic a few of the best and make sure they are big of enough to be enjoyed. 5. Embellish with favourite quotes, verses, comics, etc that you found thought provoking or funny if you like. 6. Have a proofreader. Either your spouse or a friend. Embarrassing typos can be simply avoided by having a fresh set of eyes read it over. Finally, enjoy the process. If it’s just another “do” on your “to Do” list, don’t do it. But if you truly enjoy giving and receiving through the mail, then haul out your daytimer (use to remind yourself of what happened in 2011), and a cup of coffee and type away! This is an area that we are sorely lacking in any degree of excellence. If I muster up the energy, from time to time over the years, I have thrown some lights onto the bushes up front. When we bought our first home, dear hubby and I strung up icicle lights. They look gorgeous but are a pain in the but. So they take up a whole bin taking up more room in our garage even now. One of my favourite scenes in Chevy Chase’s Christmas Vacation is the lighting up the house scene – when they blow the fuse and power in the whole neighbourhood… awesome. Maybe this is why I am afeared of the lights dilemma. Also, it gets really cold in Canada, and if you don’t have em up in October, you gonna be COLD trying to do it. And finally, I still have a hard time figuring out how to make it LOOK good. My house is big and wooden and would require serious wattage and effort to make it look right… sigh. At least we can go for a ten minute drive and enjoy the Niagara Falls Winter Festival of Lights. The reason I wanted to post about this though, is because there are other ways to “light” up your neighbourhood. Why not take a tin of christmas cookies from your baking exchange over to the neighbours, or shovel one of their driveways? Why not go Christmas Carolling in your neighbourhood (who should Halloween be the only time we knock on our neighbour’s door?) Why not leave a Christmas Card? We can find ways to bring hope and smiles to our neighbourhood and let the Light of Heaven shine in our part of the world even brighter. I keep all my Christmas Books in one area of our office/library and a few magazines I love. I pulled them out today, as I usually pull them out just before Halloween to get me in the swing of things before starting in on my Holiday Planner on Nov. 1st. Since that is NEXT WEEK – good lord – this is all perfectly timed. Recipe/ Cook Books I’ve saved these for another post. This is the newest addition to my collection. I found it at Book Depot in the discount bin at the Summer Box Sale. It was a dollar I think. Score. I love Robin McGraw and I love her style and authenticity even if it’s not really like mine 🙂 and I share her committment to God and Family. This collection would not be complete without a Mary Englebreit Book or two. I started with this one when we got married. Then we started this one a couple years ago when the other one filled up. I posted about this first one here. The second two I just leave in the bathroom for a couple weeks and peruse the points to see if there’s anything I’d like to adjust. I find that things change the older my kids get and my priorities in organizing change so it’s good to refresh every now and then. I talked about this magazine a few weeks ago. and I fell in love with Mary Norden’s ideas a few years ago in this book. I’m posting 2 posts in one today because yesterday was a FULL FULL Day and it didn’t happen. One of the best ways to really enjoy the holidays (and any season really) is to take a few minutes everyday to pause and reflect. I call it Selah time. Selah is the Hebrew word found frequently in the book of Psalms . It means to pause and reflect. The psalmist would sing the verses he had written, and then encourage the people to stop and think about what they’d just heard. Then he’d move on to the next few verses. It’s a vital step in really taking things to your heart and soul. I believe that true gratitude or “Eucharistic Living” is spent buy taking moments throughout each day to stop, reflect and give thanks. This book is essentially an exhortation to walk in gratitude. Read it. Your life will be altered. Day 24 What Colour is Your Christmas? 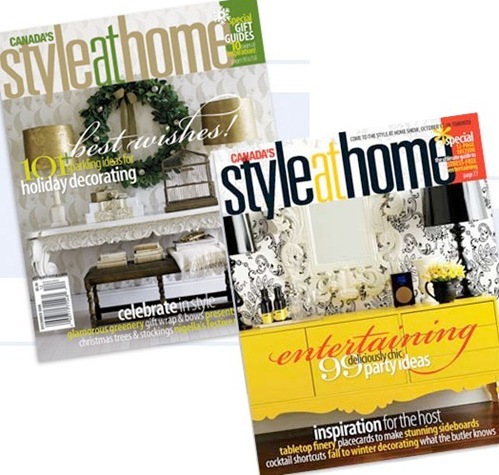 When it comes to picking your “style” for Holiday decor you may return to the same style over and over, or you may be like me and make changes to your decor each year, or you may change the whole scheme year after year. The key to doing this without breaking the bank is to change the colour scheme. I remember listening to a designer on Cityline years ago, talk about doing this. They said to invest in your “base” decor colour – gold, silver or white. and then to change the colour it essentially would only take one good sized box of a new colour – red, blue, purple, etc. I’ve tried this, and it works! So, what is your colour this year? Colour supposedly reflects our mood or state of being for any given season. What’s yours? Traditional Red, Green and White? Or you do change up the white for gold and go Classic? Do you modernize and use no colour, or are you living on the edge and going with really different colours? Do you need a bit of whimzy or fun? What you surround yourself with will bring it out of you each day, so choose well. Of course there are millions of other colour combos – I’ve done Jewel Tones, turquoise and Red and Harvest Colours with faux leaf garlands and rose and white with velvet flowers on the tree. The sky is the limit really. Sometimes after you’ve picked your colours, the “theme” comes naturally like traditional, classical, nature indoors, Oriental, toyland, country, victorian.etc. 1. It’s going to be long. But not wordy or emotional, it’s just a giant list. I FIND MANY PEOPLE SKIP THIS STEP AND END UP STRESSED THROUGH TO THE NEW YEAR. Please don’t skip it…and the sooner you start, the better. Your MIND and SCHEDULE will thank you, maybe even your family. 2. I do not do everything on the list every year. 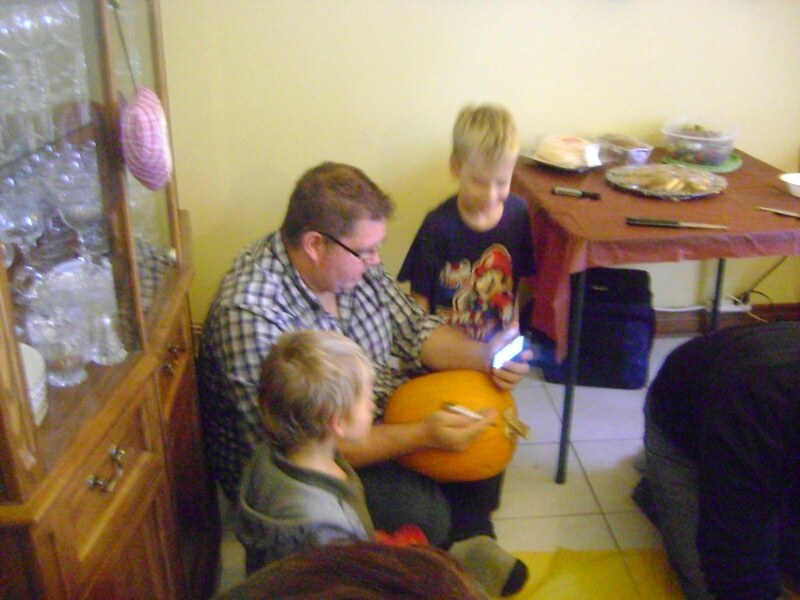 I modify the list in October (nice timing) each year for our family. 3. Based on yesterdays post, you know how I prioritize. 4. I try to combine chores with fun occasions, ie. decorating parties, shopping trips with friends (and lunch); play dates become Carolling or visiting shut ins, etc. 5. I have not completely updated my list for 2011 but I am posting it anyways for times sake. Because we’re home schooling, I’d like to add some elements to the advent aspects and creative or social things that we do during the day. I like this list because it tells me what to do – I don’t have to fill in everything. Just modify. 6. I print this off every year and stick into a binder that I leave on the counter under my daytimer. I look at it everyday. I like to be able to touch it, and smell the stains of food spilled on it from years past. But you could also just have this list in your phone. 2 years ago I bought this book on clearance and now it is my Christmas binder. Week One: Nov. 1-7 *I always start this the day after Halloween. q Gather up the Fall/Harvest Décor, books, etc in stages and return to storage. q Pull out the Christmas Décor boxes and prep an area to lay things out. 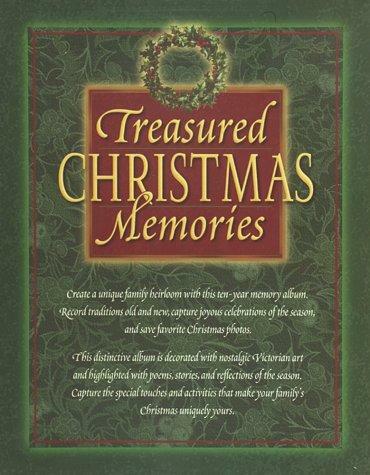 q Pull out your Christmas books, recordings, CD’s, videos… Anything new to add? q Make a decorating schedule for your home. List the areas to be decorated and what you’ll do there. q Put together a list for outdoor decorating. Ie. Giant Wreath needs an overhaul. In 2007 we used LED lights on the wreath and also had them in the urn which I did up with the red dogwood branches and fresh cuttings from outside, we used no other lights outside and it was enough. *we’d just had baby #3 afterall. q Pull out your recipe books and note favorites to bake, and new recipes to try. q Book your baking day(s). q Set a date for a Christmas Cookie Exchange, or bake off. Or both. q Make a list of new decorations you’ll need and shop for them. q Shop for gift-wrapping supplies. o Choose items like tissue paper that can be used year round. o Splurge on ribbons, artificial berries, greenery, etc. q Start a holiday calendar – which dates are booked. Are gifts needed? Meals for potlucks, etc. Dress for these events, who is attending – spouse, kids, family. Note other dates – birthdays, etc. that take place during the season. Stamps, coloured pens, labels, address books, stickers/ seals, etc. q Start Planning your family Advent Celebrations. 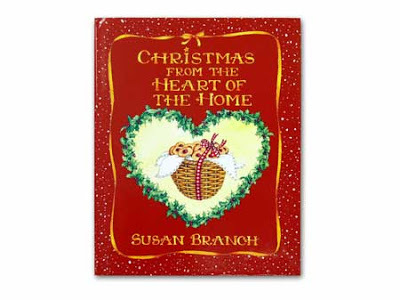 q Update your Christmas card – address list. o Return address labels. Use a nice font and plain labels. q Order/ Buy your Christmas cards. q Finalize your gift list and hit the shops. Get as many of them as you can early in the season. q Decorating on your own? o Set aside an area where you can bring out everything. o Decide which area you’ll decorate first. See list. o Bring the appropriate decorations to that area. o Complete one area at a time. q Bring out the tree the day you plan to decorate it. It’s a good idea to have a traditional date to trim the tree. Make it a family affair. q Take Out Christmas Dishes. q Make a list of Special Holiday foods to purchase. q Test and put up interior and exterior Christmas lights. q Assess what special linens, napkins, serving pieces, etc. you’ll need. Bought new gold runner; tablecloth; new red placemats & Cloth Napkins. q Purchase supplies for baking nights. q Participate in Baking Night and/or Exchange. q Write out your Christmas cards. q Plan out a couple of “holiday outfits”. q Purchase extra film for your camera to capture the moments. q Get a Pedicure & Massage. q Book a Hair Appointment. q Put up exterior decorations like wreaths, garlands and swags. q Take out China, Silver, Crystal Dishes and Serving Pieces. q Polish silverware if necessary. q Clean Glassware if necessary. q Maintain a tidy house. Devise a system for clutter. o Saint Nicolas/ Gift Give-away. q If you are having a Christmas Eve Potluck or Buffet, review your menu. After the evening service, you can spread the buffet out near the tree. Have a sing-along, read the Bible and have communion. q The Christmas Day Breakfast/Brunch menu should be checked. Make sure pantry is stocked. q Plan your table settings and centerpiece. q Wrap all gifts over a few nights. q Save invites to parties until you’ve sent a thankyou. Stock up on hostess gifts. q Check your holiday calendar include church services, etc. q Make a list of holiday calls you intend to make. Update phone #s.
q Pick up floral arrangements, if you ordered them. o If making your own, buy the flowers and supplies now. q Go over the menus and supplies one more time. Do you last minute shop. q Keep routines normal for the boys. Schedule special times alone with them. q Place the wrapped gifts under the tree if you haven’t yet. q Keep your list of rec’d gifts updated. q Check your stocking stuffer items. Draw names for stockings. q Set your holiday table one or two days before the meal if possible. Enjoy! q Read Luke 2 by Candle Light. qFamily Time; Gift Exchange; Meals; Etc. q Shop for clearance items – Christmas decorations, etc. In the next few posts I’ll be sharing other tips I use to create and maintain Holiday Bliss in our home but what I shared today is where it all begins to get sorted. PS – don’t you love the quote by Emilie Barnes at the top of it. I love her and read her stuff to get the much needed inspiration and heart focus for enjoying this season fully. I have a philosophy for planning. Most people who know me think I’m super organized, but those who really know me, know that I am often scattered in my thinking, my schedule and my life. My kids, my husband, my DOG and my teenage borders have a way of turning perfectly normal days into chaos without even trying. I am often late for things – though I ABSOLUTELY HATE being late…usually because of this scattering. It doesn’t matter how hard I try to pull it together, there are too many other people and factors pulling on my priorities. One thing that does help me get through these seasons, and that helps me keep it in perspective and to enjoy the process, is that I am an obsessive PLANNER. I review the plan for things in my head – and often on paper…OFTEN. My God, My family, My extended family, my ♥ friends, the family of faith, my other friends and the rest of the universe. So I try to plan to cultivate and bless those relationships…on purpose. If I want to enjoy the Autumn season – I plan. What would I love to do, what would be nice to do, what MUST I do and then try to schedule, make room for and invite others to participate in. If I’m going to host a party, then I plan before the invites. How big should we go? What food will we have? where? When? Who? What activities shall we do? I fail all the time, usually because I failed to follow the plan. Tomorrow I shall share with you, my “stress free holiday plan” I’ve used it for about 5 years now, and I have enjoyed the past 5 years so much – except for the year I failed to plan Christmas Eve and spent that night crying in the bathtub long after it had drained, cold and alone… but more on that tomorrow.